Palm Springs, Calif. — An exciting day of playoff baseball in the California Winter League kicked off with the Palm Springs Chill taking down the Palm Springs Power, 8-2, in a big upset. The Chill, the No. 4 seed in the American division, came into the day as underdogs to the No.1-seeded Power. But timely hitting late in the game and a great start from Logan Campbell led them to victory. In the first inning, it was the Power who got on the board first. Haydon Mahe-Liessmann tripled to deep right field and later scored on Taylor Grace’s RBI single. Cletis Avery brought in another run when he walked with the bases loaded. The Power held that 2-0 lead until the fourth inning, when the Chill offense woke up. Zach Files led off the fourth with a triple to the right-center field gap and the next batter, Ryan Weston, singled him home. Then in the fifth, Jacob Barbee hit a one-out double and James Lunardelli followed with an RBI single to tie the game, 2-2. The game remained tied until the top of the seventh when the Chill exploded for six runs on four hits, sending 11 men to the plate in the inning. The inning started with Files drawing a walk, then Weston hit a single, and Thomas LaCongo followed with a sacrifice bunt to move the runners to second and third. Rock Smith was intentionally walked to load the bases with one out, then Will Decker was hit by a pitch to force in the go-ahead run, which turned out to be the winning run. But the Chill didn’t stop there. In the inning, Elijah Briseno and Zach Nehrir had RBI singles, Jacob Barbee had a two-RBI single, and Files hit a sacrifice fly to make it 8-2. Brandon Warner pitched a scoreless seventh inning to get the save. Campbell got the win and dominated over his six innings on the mound. He allowed just two first-inning runs and struck out three batters. Christian Colletti suffered the loss for the Power. The Chill will face the No. 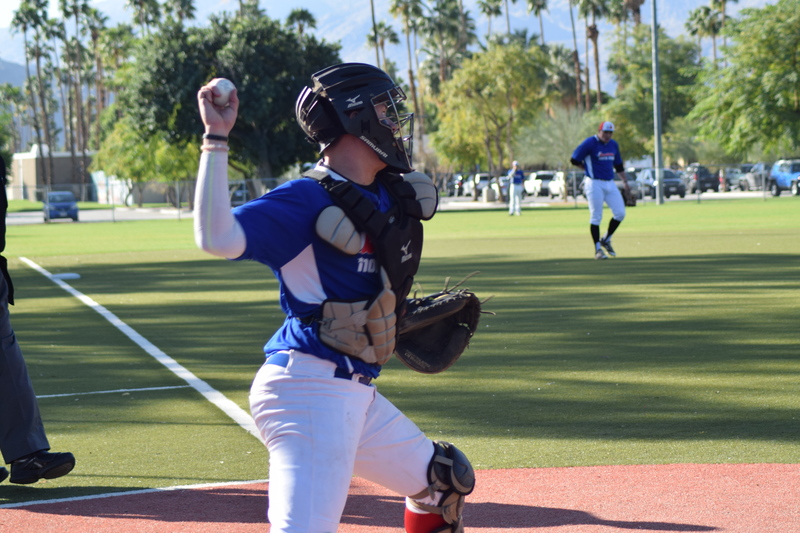 3 seed Washington Blue Sox in tomorrow’s American division championship game at 12:30 p.m. at Palm Springs Stadium. The winner of that matchup will advance to the CWL Championship Game Sunday afternoon. The Canadian semifinal round ended in the No. 1 seed Toronto Rush defeating the No. 4 seed Alberta Grizzly, 6-5. A late Grizzly run made the game interesting in the seventh, but the Rush managed to strand a runner at third to escape victorious. Trailing 6-4 in the top of the seventh, Alberta started a rally with one out following a Brett Thompson single. After a Matt Jeffery fly out, Gabe Gunter kept hope alive with a two out single to set up Sam Krick with runners at the corners. With two strikes, Krick singled home Thompson to cut the deficit to one. Gunter, representing the tying run, stood 90 feet away, but watched Rush closer Andrew Baxter induce a fly ball to right field that ended the contest. The Grizzly jumped on Rush starter Cody Pamperin for three runs in the first on four hits. Adam Gauthier singled home a pair on a groundball up the middle, and Christopher Mangus doubled in Gauthier to go up 3-0. Toronto answered immediately in the bottom half, sending seven batters to the dish and plating three runs themselves. Raul Shah singled home Connor Hoffman and Shah later scored on a wild pitch to cut the deficit to 3-2. Tanner Klein drove in Robert de Angelis with a base hit to tie the game headed into the second. The Grizzly would not be outdone, as they managed to push across a run in the next half inning on an RBI single from Matt Jeffery to take a 4-3 lead. That would be the last time Alberta owned a lead in the contest. In the third, de Angelis walked and later scored on a Mason Schoettlin RBI single to tie the game for the Rush. Then, in the fifth, Toronto sent eight men to the plate and took a 6-4 lead on a Schoettlin RBI double and Jon Bannister sacrifice fly. Cody Pamperin got the win after throwing six brilliant innings without walking a batter and striking out 11. CJ Bahn took the loss for Alberta. The No. 3 Manitoba North Stars rode an early 3-0 lead and benefited from a four run sixth inning to shut out the No. 2 Canada A’s, 7-0, in the second round of the California Winter League playoffs on the auxiliary field. Chris DeRue pitched a complete game gem, allowing four hits and one walk while striking out 10. The top of the North Stars lineup shined offensively, as the first four batters combined for all seven RBI. Will Krug stood out among the pack going 4-for-4 with a home run, two RBI and three runs scored. Adrian Guzman finished 2-for-4 with a double, two RBI and a run scored. Cory Slater and David Kerian combined for three RBI in the playoff win. Tyler Post reached base twice for the A’s, but the rest of the lineup could only muster three hits against DeRue, who was outstanding. The No. 3 Washington Blue Sox picked up a win over the No. 2 Oregon Lumberjacks, 3-1. Joseph Costello pitched a complete game for the Blue Sox, allowing just four hits and striking out five batters. Five different players had hits for the Blue Sox. Sam Burton took the loss for the Jacks. 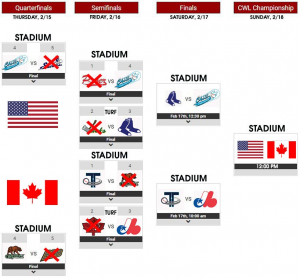 The Canadian and American division champions will be decided on Saturday, February 18 at Palm Springs Stadium. The No. 3 seed Manitoba North Stars will face the No. 1 Toronto Rush at 10:00am. The No. 4 Palm Springs Chill will take on the No. 3 Washington Blue Sox at 12:30pm. Concessions will feature “Suds-on-Saturday” at Palm Springs Stadium for the semifinal round of the playoffs. Those in attendance can enjoy $2 draft beers all day long. Those not in attendance may listen to the broadcast live online at CaliforniaWinterLeague.com. ©2019 California Winter League. All rights reserved.